Emelie Ilarde MD FAAFP - Lawn Medical Center, S.C.
Dr. Emelie Ilarde, Board Certified in Family Medicine, began caring for patients at Lawn Medical Center in 1999. Dr. Ilarde received her Bachelor of Science in Chemistry from St. Xavier University, where she also minored in math and Spanish. Honoring her initiative in achievement and service, she became the recipient of the Congressional Award Gold Medal. 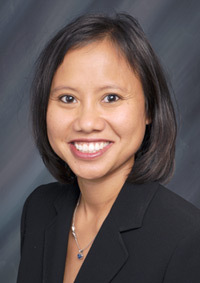 Furthermore, Dr. Ilarde serves on Advocate Physician Partners’ Credentialing and Peer Review Committee and is a member of the Performance Improvement Committee at Advocate Christ Medical Center. Additionally, she is a member of the Physician Leadership Institute. Dr. Ilarde is a Fellow of the American Academy of Family Physicians. As a premier mid-sized Patient Centered Medical Home, we strive to work as physicians and associates to competently and compassionately promote and provide excellent health care to the individuals, families and communities we serve. For existing patients, click here to access our patient portal. call 708-425-5500 to speak with our answering service. In emergency situations, call 911.